I used this activity before reading the book, Please DO Feed the Bears by Phyllis Reynolds Naylor. Preparation: Cut out pictures of bears (or other animals).I got my cute bear from the back of a Teddy Graham Box. Glue one to each side of a box. Cut a hole where the animal's mouth is located. Loosely tape one side of box so it will stay closed while your child is playing, but could open up later. To play: Give your child a handful of dry pasta. Model poking the pasta into the animal's mouth to feed the animal. It totally looks like my teddy is smokin' something but I wanted you to see how the pasta just pokes right in there. My son is 2 years old and he loved doing this over and over and over. Variation: I also made one of these when we were reading books about zoos. On each side of the box, I glued a different animal. We then were the zookeepers and fed each animal. 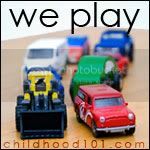 I'm linking this up at Childhood 101, we play. Thanks for stopping by NurtureStore and leaving a comment. You're right - so important to include lots of open ended play. I'm going off to explore more of your blog now - glad we linked up. we did something similar Feed the Caterpillar and used the the book The Very Hungry Caterpillar by Eric Carle. The kids had so much fun! Such a simple idea but clearly one which young toddlers would love! I'm going to let my group of little ones roll a number cube and then feed the bear that number of noodles. Love this! I think I'll have my group of little ones roll a big number cube and feed the bear that number of noodles. I love that idea. I'm going to give it a try with my boys! Thanks for sharing Julie.